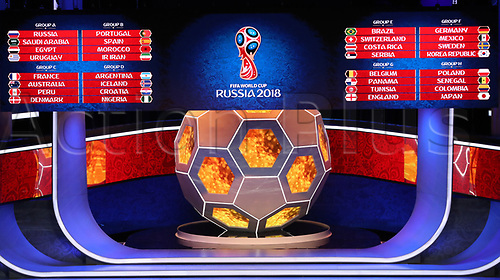 1st December 2017, State Kremlin Palace, Moscow, Russia; The display boards show the drawn groups from A to H during the FIFA 2018 World Cup draw, at the State Kremlin Palace in Moscow, Russia, 01 December 2017. Group A includes Russua, Saudi Arabia, Egypt und Uruguay. Group B includes Portugal, Spain, Marocco and Iran. Group C includes France, Australia, Peru und Denmark. Group D includes Argentina, Iceland, 1st December 2017, State Kremlin Palace, Moscow, Russia; Croatia and Nigeria . Group E includes Brazil, Switzerland, Costa Rica and Serbia. Group F includes Germany, Mexico, Sweden, and South Korea. Group G includes Belgium, Panama, Tunisia, and England. Group H includes Poland, Senegal, Columbia, and Japan.